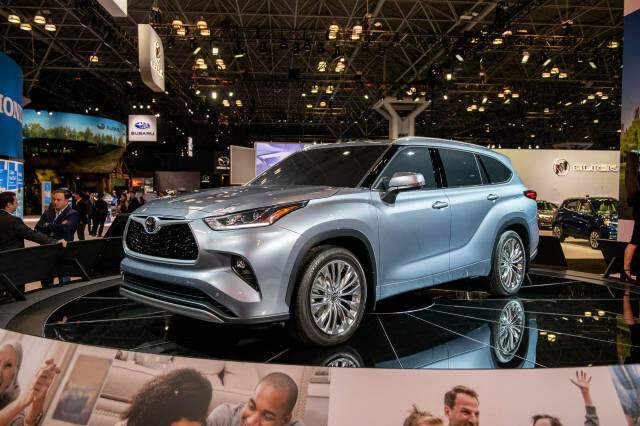 Chevrolet's car fortunes are on the upswing, the momentum generated by new vehicles like the beautifully finished Cruze compact sedan and the eager little Sonic hatchback. Now it's the Malibu's turn, and the venerable nameplate ushers in big changes for the 2013 model year, all in the name of getting smaller and more efficient. The Malibu, Chevy says, is its first global sedan, but the version coming to dealers in the spring will be unique to the U.S. market. We'll be the only ones to get the amped-up Malibu Eco, a green-tinged four-cylinder, four-door, five-seat sedan, augmented with a battery pack and a motor that boost gas mileage and elbow aside any V-6 option in the process. GM hopes its variety of planet-hugging will cut through the clutter of, well, just about every other repositioned family sedan that's been electrified in the past few years. We drove the 2012 Chevy Malibu Eco yesterday around Austin, Texas, in a fit of fog and rain, something Austin's been running lean on for far too long. Our first driving impressions? It's a completely different Malibu in look and feel than the four-door just drifting out of memory. On the handling and efficiency fronts, that's progress. GM cites a lot of Camaro influence in the details, and it's easy to see some of the heritage appeal molded and shaped into the gauges and taillamps. The new Malibu looks much smaller than it did last year, though it's not even a half-inch shorter overall. The quest for aero smoothness--and global dimensions--leaves this Malibu with a better front end than rear. The Malibu Eco's split grille wears the Chevy badge proudly--it's pretty large--and the Eco's front air dam has some pretty emphatic elbows embossed into its lower corners. That helps give it more heft, as does the pronounced, VW-like stagger of the grille and headlamps. The aerodynamics start to have their way with the shape at the corners of the headlamps and at the small, set-off side mirrors. Down the sides, the Malibu picks up some subtle sculpturing, and by the time the sheetmetal wraps around the rear pillar, it's started to resemble Fortes and Camrys. The decklid and taillights are tiered like those on the last-generation Camry, too, but the rounded corners of the Malibu's high rear lamps bring it more in line with other current Chevys. While I'm more mixed on the Malibu's new shape, my colleagues aren't. They love it. To me, the former Malibu pulled off a more imposing look with flatter, plainer surfaces. The cockpit delivers its details with more unity. Big square-ringed gauges sit behind a thick steering wheel at a lower vantage point, and the center console gets a perimeter of glossy grey plastic that's identical to the stuff in the Volt--though the Malibu gets real buttons, not capacitive switches, to run its major functions. There's a large LCD screen front and center but also big, grabby knobs for major audio and climate functions. Designers took some visual heft out of the dash by cutting strakes across the surface and glinting it with metallic trim, but the dash itself doesn't seem thick enough to warrant the fuss. There's also some trim on the Eco model that seems to want to be woodgrain, except up close it's more metallic and woven in appearance. Taste points aside, it all feels good to the fingertips. Eco assist, but no "hybrid"
A 190-horsepower, 2.5-liter four and a turbocharged four-cylinder are coming to the Malibu lineup later in the 2013 model year. At launch, GM will build all Malibu sedans as Eco models, at its Kansas plant, alongside its Buick LaCrosse eAssist model, which marked the debut of the mild-hybrid technology. The eAssist name isn't used on the Malibu Eco, though it's the same setup, essentially the second generation of GM's mild hybrid technology. 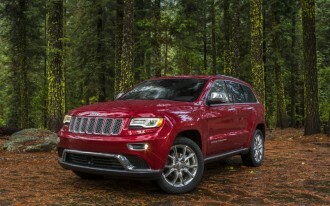 Here, the basic 2.4-liter, 182-horsepower four-cylinder engine is teamed to a six-speed automatic. 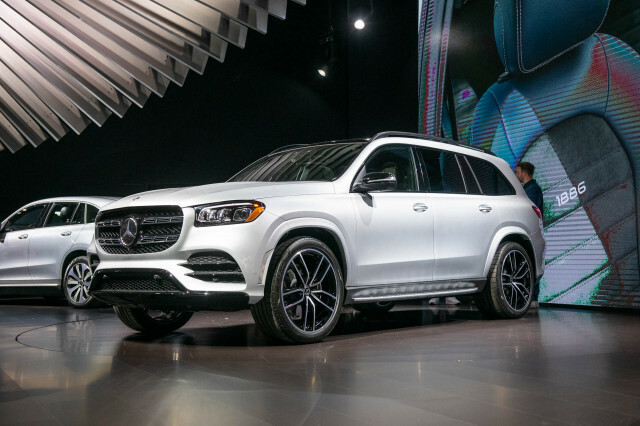 The gas drivetrain is in turn teamed with a 15-kW motor, a battery pack housed behind the rear seats, a stop/start system, and a regenerative braking system that keeps the lithium-ion batteries topped off. In practice, the gas engine is responsible for almost all the power when it's on, but the batteries do deliver some torque so that the transmission can be geared taller, which in turn allows the engine to run at lower rpm in some circumstances, all to boost fuel economy. When the car comes to a stop, the engine turns off, and the batteries provide supplemental power and restart capability. When the driver lifts foot from brake, the Malibu Eco restarts automatically. The batteries are recharged on the go via the motor and regenerative braking. The Malibu also gets other efficiency tech like the LaCrosse eAssist, including active shutters that smooth the airflow at its front end, low rolling resistance tires, and lighter-weight materials. Our first drive in the LaCrosse eAssist left us with good impressions. The same is true of the Malibu, which does an impressive job of forgetting it's a hybrid, mild or no. 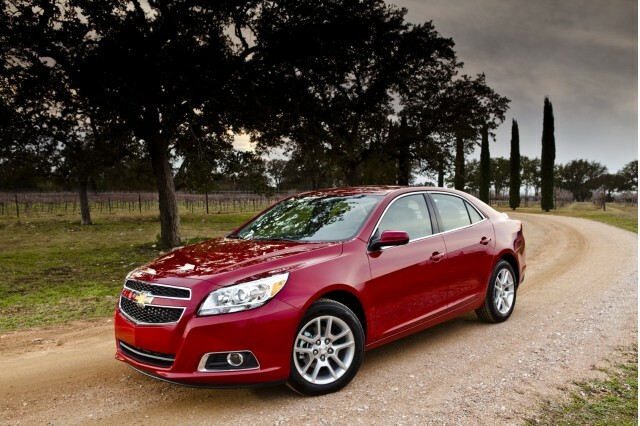 The blending of battery and engine torque doesn't leave many footprints on the Malibu's smoothness. The windup of its four-cylinder engine is tamed really very well, while outright performance is in the eight-second 0-60 mph ballpark. There's a somewhat silly click switch on top of the shift lever, like the side-saddle one on the Ford Fusion, in case you get the urge to keep a hand off the wheel and grab gears at will. The payoff: the Malibu Eco delivers 25/37 mpg. It neatly divides the non-hybrid and hybrid versions of strong-selling sedans like the Sonata (24/35 mpg or 35/40 mpg), the Fusion (23/33 mpg and 41/36 mpg), but fades compared with the dull new Camry Hybrid's 43/39-mpg rating. GM says the Eco delivers almost 600 miles of range on a tank of gas. The opposite of before, this Malibu's handling is a reason to seek it out. Of all the electric-assisted family cars we've driven in the past year, the Malibu has the best steering response, period. It doesn't feel detached. It goes where you point it, and no further, and no closer. There's actual feedback, and even compared to the class acts of electric steering--mostly Ford and VW--the Malibu betters them with just-right heft. It's a great companion for the front strut/rear multi-link suspension: GM promised us European-influenced handling and it's here. It's a pretty stark contrast with the regal-riding 2011 Malibu, the one that cut into corners like kindergarten-issue scissors through construction paper. This one keeps its wheels in line, and skims off the worst road surfaces without slop. 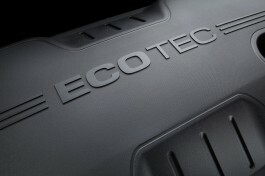 The tuning makes us more eager to drive the upcoming turbo edition, without the Eco's tires or brake-pedal feel. The low-rolling-resistance treads were a bit too ready to slip in light rain that hardly covered Austin's highways. The brake pedal felt hard, and the combination of aggressive regen and tires underscores that this version isn't the sporty one. The Malibu's interior space specs out like those of the competition, but its shorter wheelbase shows up in its back-seat comfort. We'll take the front seats any day. GM's paid as much attention here as it has in the Cruze and Sonic, and that gives the Malibu deeply pocketed front seats, with a wide range of tilt and adjustment to both cushions complementing the low-set gauges and telescoping wheel. Three hours into our Malibu drive, we still felt fresh, especially since its active headrests didn't present themselves too far forward, a problem we're finding on more new vehicles seeking out top crash ratings. Chevy says the Malibu's wheelbase is about 4.5 inches less than in the last car. So while it stacks up well with the competition in overall length, some of the specs and numbers seem to want more explanation. Front and rear legroom are the big, defining terms of four-door sedans, and the Malibu promises 42.1 inches of front leg room and 36.5 inches of rear legroom. Compare that with the Sonata, at 45.5 inches front and 34.6 inches rear, or the titanic VW Passat at 42.4 inches front and 39.1 inches rear. In total the Malibu is smaller by a couple of inches, and it's likely that close because of the way the rear seat is shaped. We'd gladly give up a couple of tenths of an inch for a rear seat in the Malibu that sat a little higher, or was a little longer. 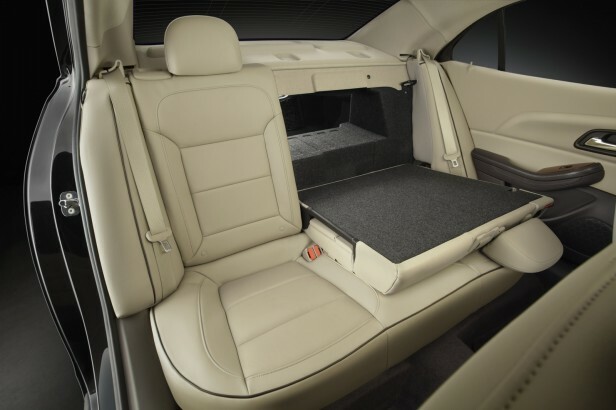 As it is, the rear bench is short and low, and still a little lacking in headroom for the tallest adults. From having one of the most spacious and comfortable rear seats, the Malibu now has less rear-seat space than the Nissan Altima or Ford Fusion. In other small ways, the Malibu's been carefully shrunk. The center console doesn't seem to have room for a storage bin, but flick the protruding niblet under the LCD touchscreen and the panel flips up, revealing a storage space--albeit one without a USB port or power point, where you might expect them. They're in the center console, which doesn't have any rear-facing air vents on its backside for back-seat passengers. 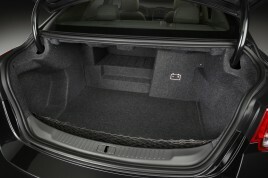 Trunk space is slimmed down, too, to make room for 2.0 cubic feet of Eco batteries. In all, it's 14.3 cubic feet, larger than most hybrids, but a couple of cubic feet off the mainstream models. The Malibu's nearly as well stocked with features as the very best vehicles in its class, starting with safety features. Eight airbags are standard, with an optional pair of rear-seat side airbags on the way during the model year. Chevy expects five-star crash ratings across the board, which would put it atop the NHTSA's rankings, though not all of the competition has been re-tested under the NHTSA's new formulas. 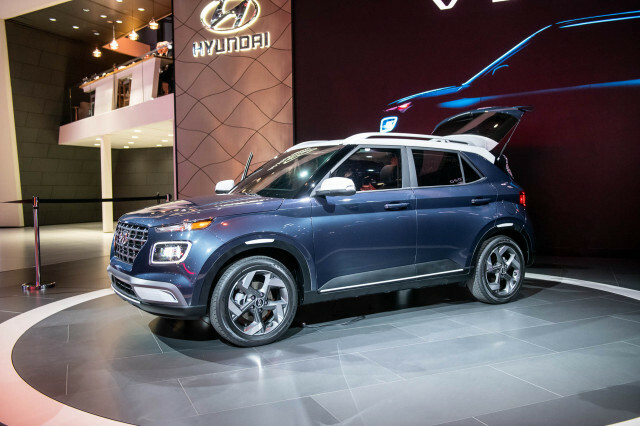 A rearview camera is standard on the Eco, as are rear parking sensors; a lane-departure warning system and a forward-collision warning system are in the pipeline, too, while OnStar hardware is standard equipment. 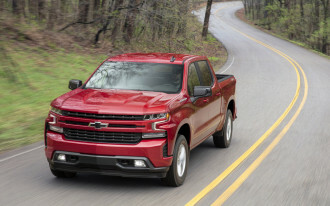 Other standard equipment includes Chevy’s new MyLink connectivity system, which allows drivers to stream Pandora internet radio and catch up with podcasts on Stitcher. GM is weighing the benefits of in-car, voice-to-text and text-to-voice communication, but as of yet the Malibu Eco won't deliver either of those features, which are available on Camry and Sonata and on Ford's MyFord and MyLincoln Touch-equipped vehicles, too. 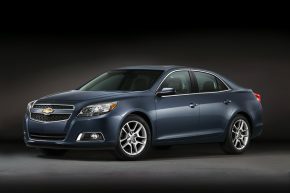 The 2013 Chevrolet Malibu Eco arrives in showrooms in the spring, wearing no explicit "hybrid" markings, but with small green Eco badgework and with a pricetag nearly as high as some more efficient hybrids and diesels. 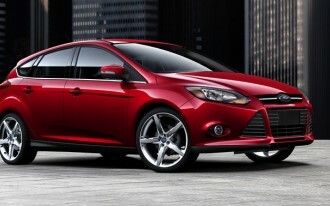 The base price of $25,995 includes a $760 destination charge, but excludes any options. It's significantly shy of, say, the Fusion's 41-mpg city EPA rating--but then again, it's significantly cheaper than that $30,000 full hybrid, if not too much less than the $27,000 Passat TDI. Tweener pricing may help the Malibu's tweener gas mileage and tweener interior space. On those fronts, the handsome, well-executed, unexpectedly nimble Malibu Eco has a marketing mission cut out for it. Tech-wary drivers may grok to its invisibly efficient 37-mpg highway EPA rating, but early adopters already have veered off toward the Volt or other plug-in solutions, or before that, the higher mileage of the Camry and Fusion hybrids. 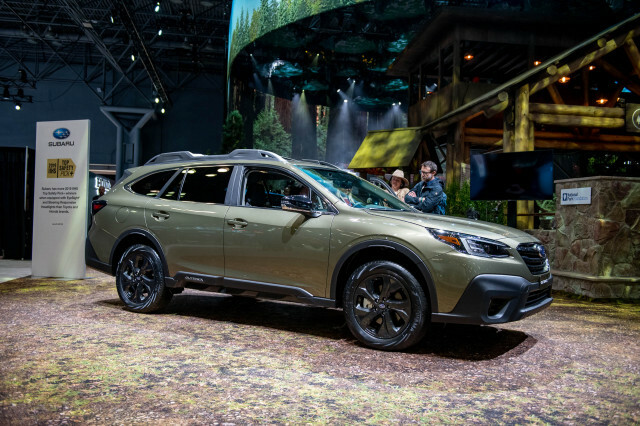 At the same time, the folks looking for Texas-sized interiors will probably head off into the sunset, in the direction of the Accord or a Passat, or the next Impala, as is likely the plan. Then there are the ballsy-looking Sonata and Optima, and--we hear--the new Fusion, which cut sharper, standout profiles. The new Malibu's a success, but qualified, with big steps in all the right directions, except maybe the most visible ones.